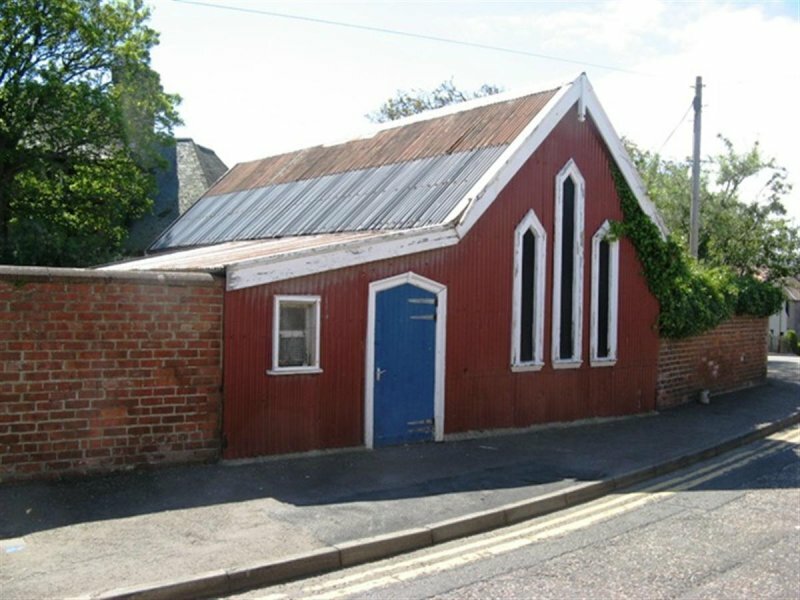 The Tin Tabernacle is a fascinating vernacular building, formerly a hall to St Anne’s Episcopal Church, which was also made of tin. There is a note in the parish history that the tabernacle was dismantled and transported to Dunbar all thew way from Falkirk, where it was no longer required. St Anne’s “iron church”, on the other hand, was originally supplied by a Liverpool company in 1876, before the construction of the current church sometime after. The iron church was subsequently transported to Edinburgh in the late 1800s for use by another congregation. According to the Buildings at Risk register the construction of churches and other buildings in corrugated iron flourished from 1855 right the way up to 1930s. Clearly they were quick and easy to put together, often supplied as kits through builders’ merchants, in a variety of sizes and designs. The construction was basic with corrugated iron bolted to a wooden frame, while the interior would be lined with tongue & grooved board (Vernacular Building 29, p 680). Just do a google image search tin tabernacles of check out my random collection on pinterest, see below. 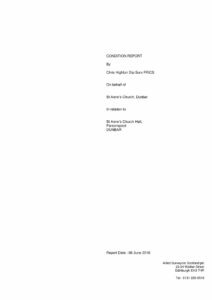 In this case it is a plain single storey former tin tabernacle with 3 lancet shaped windows onto the street elevation and door and window to a side extension – lean-to. Currently painted red and blue and lined internally with painted timber. There are some very fine tin clad buildings around Britain and tin is having a bit of a renaissance, increasingly used by modern designers. 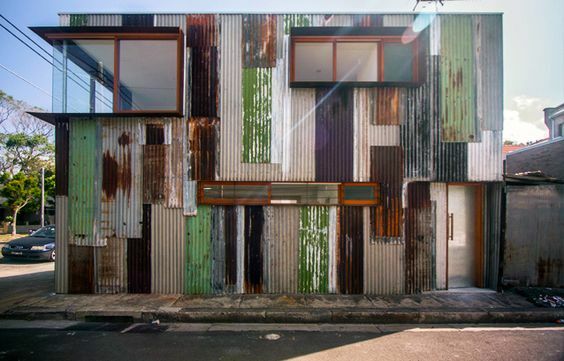 Even ‘used’ tin can be repurposed with striking effects. Ironically, although quite a rare surviving example, the Dunbar Tin Tabernacle building has not been listed, and is afforded no protection. But it is on the Buildings at Risk register, so clearly someone thinks it has some merit. Indeed the risk status has moved from from low to high as a result of a proposal to build a new bungalow on the site. As so few of these buildings survive, and the great british passion for all things shed, it seems to me at least, incomprehensible that there is a planning application, still to be determined at the time of writing, to demolish it. The application, in typical small developer vein, is for a mediocre bungalow with obligatory car parking, but no garden to speak of, and barely pays even lip service to its context – the old manse grounds – let alone the position as a gateway into the Dunbar Conservation Area, albeit a minor entrance. There is no local clamour to protect it yet it would not be expensive to make it into a serviceable building. The recently submitted condition report claims it would cost a full £35k to repair – a very expensive shed indeed, but to my mind this is an altogether negative and biased assessment based on looking at the building through a modern renewal lens rather than a sensitive restoration one (in fact there’s barely a mention of its history and heritage or its local importance), presumably as the intention was designed to propose demolition on the basis of it being unreasonably costly to restore. I wonder how much is being spent on St Annes church right now?